Light blue shirts with half sleeves and one pocket. Navy blue shorts with side pockets and loops at the side for the school belt. Students upto standard VI should wear shorts only. Students from Std. VII upwards who are above 150 cm should wear trousers. 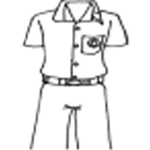 The cloth badge should be stitched on to the left pocket of the shirt. Navy blue trousers with loops at the side for the school belt. Light blue shirts with two Navy blue broad stripes 1.5 cms away from the front edge of the left collar. The cloth badge should be stitched on to the left pocket of the shirt. Navy blue pleated pinafore of knee length with loops at the side for the school belt. (Pleats size 5 cms.) The cloth badge should be stitched on the left hand side, just below the shoulder strap of the pinafore. Box pleated pinafore reaching 5 cms below the knee. The cloth badge should be stitched on the left hand side, just below the shoulder strap of the pinafore. Navy blue salwar, light blue kameez with um-brella-cut (no slits) and navy blue dupatta. 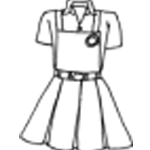 The cloth badge should be stitched on the dupatta (see diagram-5). The sleeve must be of elbow length. The neck of the kameez must be round in shape, 5.5 cms in depth in front and at the back. Light blue shirt with half sleeves and shirt collar. Belt : Will be available in the school store. Std. I to XI Bata Scout/Super stride Bata shoes (Black) and navy blue socks. (Boys) No other type of footwear will be permitted. (Girls) type of Footwear will be permitted. sandak only. Footwear can be bought from Bata Showrooms. Please note that there is no separate uniform to be worn on Wednesdays. Uniform of Std. I can be stitched at the tailoring unit run by Bharatiya Vidya Bhavan’s Mahila Vibhag, Gandhinagar, Kochi - 20. Other classes also can get the uniform stiched from Mahila Vibhag. Students should be in full uniform with polished shoes and neatly ironed dress. During rainy season, all students shall use black Sandak. No other type of footwear shall be permitted. Boys must cut their hair short and girls must come to school with neatly groomed hair on all days. Colouring of hair is prohibited. Boys of higher classes should come with clean shaven faces.